Discussion in 'BushClass USA' started by IA Woodsman, Mar 31, 2011. LadyVet and Joe to the woods like this. Utilized a BCO 10 x 7 tarp. LadyVet, Medicine maker, Joe to the woods and 2 others like this. I took a couple passes at this today. Lots of good lessons learned. First up, simple pup tent setup, as described in the lesson using the three strand braided ridgeline I made in the braiding lesson. Nylon clothesline is damned stretchy, even more so after braiding. Hard to keep the tension I wanted on it. Pup tent configuration is very good when your tarp doesn't have a center loop for suspension. Loose sandy soil right after a big rain doesn't like to hold average length aluminum stakes under pressure. The ridgeline is heavily bowed, but is tight after significant stretching. Next up, I set up a lean to using a technora ridgeline I made. When you forget to bring smaller diameter line for prusik knots for the ridgeline, paracord is a lousy substitute. Paracord almost works, but slips just a bit under pressure. In keeping with the spirit of the exercise I improvised some additional ties i would have in my bag to the trees to keep the prusiks from sliding. Took a second pass at this today... Wanted to experiment with some different approaches. Focused today on using toggles and getting comfortable with using a trucker's hitch. Toggles for the fixed loop end of a ridgeline really are the way to go. The flexibility and freedom it allows you go largely unremarked. Might just be I noticed it more being somewhat new to tarp usage. When I got something wrong or wanted to change the setup quickly the toggle let me just pull a pin and reset a fixed end. Tarp is an aquaquest 10x10. LadyVet and Medicine maker like this. Today was knot day... worked with prusik and carabiner setups for attaching to a ridgeline. Tie out toggles attached with tautline and clove hitches. Worked an asymmetrical lean-to close to the ground, with partial front side shelter and a straight up tall lean-to, but using my second ridgline and overhead branch to pull up the center. Here's my entry for the tarp shelter... I use a few different tarps and styles... Is this acceptable? Thanks. LadyVet and MrFixIt like this. Today I practiced with the tarp setup. Honestly, this is a skill I need much more practice on (my Kelty tent has seen a lot of use). My wife purchased this tarp setup for me so today was a good day to try it out! I tried several different pitches, but the simple a-frame and plow style were the two that turned out decent. A tarp ain’t a tent. I need more practice! LadyVet, MrFixIt and Joe to the woods like this. Here is a tarp shelter when i was hammock camping. Here is my hammock set up for our 3 night Current River float trip. I have now upgraded to an ENO XL that is lighter and easier to pack. We still bring the roofer tarps for “just in case” situations. They are much more durable than the light nylon flys and I don’t mind putting them through some abuse that I would not subject the high end hammock tarp through. LadyVet and Teeps like this. So I actually did this one last weekend without meaning to. I thought I had a tent but I left it at home, so I took my poncho that had grommets and made a tent with the poncho and a ridge line. I also whittled sticks to a point to make some pretty solid stakes. You can also see in the third picture one way I was taught to secure the corner to the ridge line (all of this was in a weekend Bushcraft class - great stuff). This handy little tent even withstood the rain that came unexpectedly in the middle of the night! LadyVet, Smither and Teeps like this. Did this on a squirrel hunting overnight a couple of nights ago. Was a cold night, I stayed plenty warm. Cheers from Michigan! Edit - PS: I was rewarded for it! LadyVet and Tom Eickenberg like this. Had to set the tarp up quickly because the rain was coming. LadyVet, Lonewalker, Medicine maker and 1 other person like this. 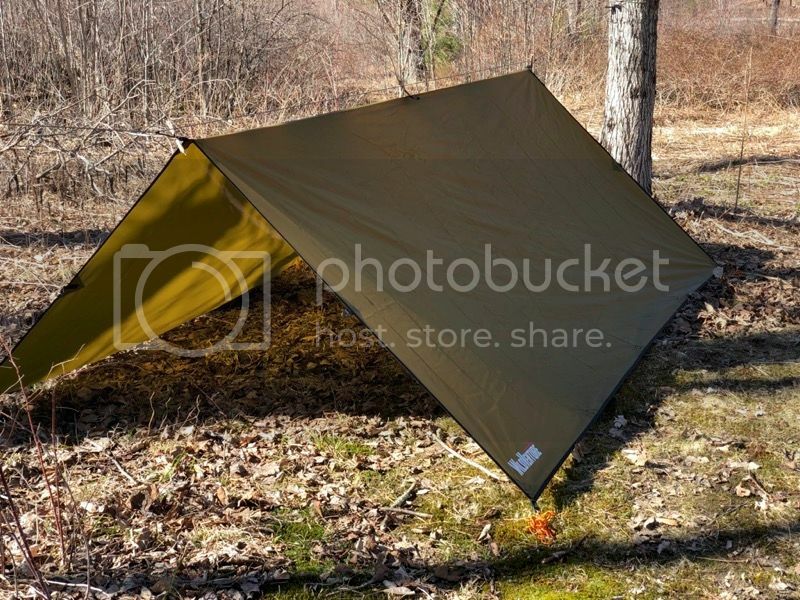 Tarp shelter, I think it's the configuration I want to use when I go camping with our local Scout group soon. LadyVet, Medicine maker, Tom Eickenberg and 1 other person like this. LadyVet, Medicine maker and notoiletpaperinthewoods like this. Here's my tarp shelter submission. 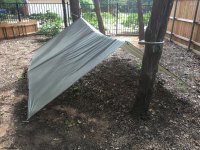 I used a 10x12 BCO nylon tarp. To be clear, I rarely use tarps in the desert due to lack of good trees where it's open, and lack of open ground where there are trees. With that in mind, and not wanting to drive ~2.5 hrs to the mountains, I found a mesquite tree with some open ground and rigged a shelter from the sun. And that completes all my Basic lessons and electives! LadyVet, Tom Eickenberg and notoiletpaperinthewoods like this. LadyVet, Lonewalker, rsnurkle and 2 others like this. Hello all, heres my tarp setup...thanks for looking. Bubbles, LadyVet, Lonewalker and 1 other person like this. Mine is just my old issue poncho, some 550 and a few bungee cords out in the yard. It's dry season here so I wouldn't recommend sleeping on the ground, unless you really like ants! Bubbles, LadyVet, bEaMann and 2 others like this. Tarp was necessary yesterday to make the twig fire happen. Cheap tarp I usually use as a footprint for my tent, think I got the concept down though. Bubbles and LadyVet like this. here's my tarp a shelter. It's a 10x12 canvas tarp waterproofed with latex primer. Bed is a raised platform with pine boughs as a mattress very comfortable. Here's my setup in Catalina State Park in AZ! Bubbles and davycrocket like this. This several tarp set ups I have used. 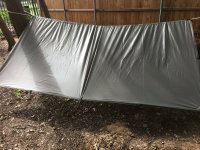 I put up my tarp yesterday in an A-frame shape. I used a couple of knots from the basic knots lesson: Figure 8 on a bight for the first end of the ridgeline, and a taut-line hitch on the other end. I have prusik knots to hold some small loops to the ridge line. I attach them to the tarp itself using toggles made from a stick. This makes a roomy shelter, since the tarp is 3m x 3m, more or less. 5x7 tarp has grommets only at the corners. It has 4 aluminum stakes with it and I used the sm2 strand twist ridge line i made earlier.